This is the third post in the Noise Monitoring blog series. Just as beauty is in the eye of the beholder, what’s perceived as noisy and not is in the ear of the listener. An unacceptable level in one setting is more than tolerable in another. For proof, consider that live rock music clocks in as high as 120 dBA (sound pressure or decibels A-weighted to match human hearing). On the other hand, classical chamber music in a small auditorium runs 70-85 dBA, as much as 16 times quieter. Likewise, all hospital noise isn’t created equal. The World Health Organization (WHO) recommends background sounds in patient rooms at night should run about 30 dBA. That is about the same as a quiet rural area. Instead, studies have found that the average runs 50 to 80 dBA – as loud as a chain saw. The noise level is growing and patients notice, with 42 percent dissatisfied. In a neonatal intensive care unit (NICU), the recommended level of operational noise is 45 dBA, while transient noise should be no more than 65 dBA, about the level of conversation. Noises in the upper 70s dBA are annoyingly loud to some people. Hospital clinical staff areas can generate in excess of 90 dBA. Such noise can filter out of nurses’ stations and disturb patients’ sleep. The possible impacts of noise on patient health include elevated blood pressure, increased heart rates, depressed moods, and other medical complications. For hospitals, this can be bad for the bottom line and patient satisfaction because lack of rest slows healing. Hospital construction and the materials used can contribute to a noise problem. Hard surfaces are easy to clean and therefore are often used because cleanliness contributes to better patient care and outcomes. However, hard surfaces reflect sound instead of absorbing it. Hence, they allow noise to travel further than it would otherwise. Just as there is a wide range of acceptable noise thresholds within a hospital, there are also are a wide variety of sources. A survey of patients revealed that the top five noise sources were alarms in the room, medical equipment in the room, rolling carts in hallways, and people talking in the room and outside of it. 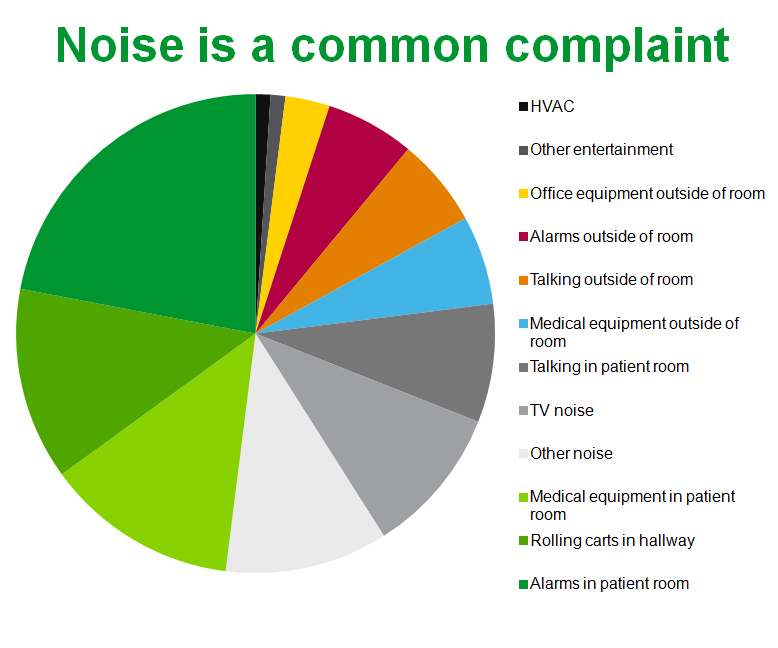 Other sources of noise cited in patient satisfaction surveys included alarms outside the room, entertainment systems, office equipment, and noise from heating, ventilating and air conditioning (HVAC) systems. So, what does this imply for abatement? 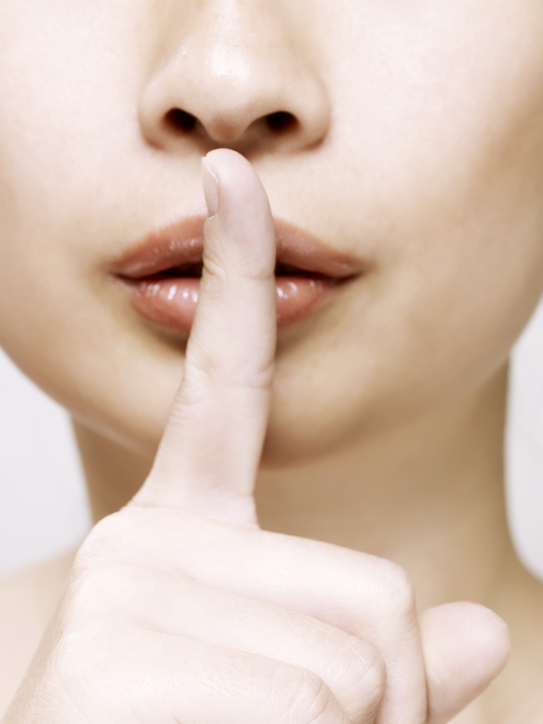 Well, it means that a variety of hospital noise-reduction strategies must be used. For instance, sound dampening surfaces that are washable and appropriately sterile can muffle sound. So, too, can providing headphones and encouraging patents to use them for entertainment systems. During renovation, scheduling can help minimize the health impact of noise. Abatement should be tailored for specific areas and to meet particular requirements. As for noise monitoring, solutions should be flexible, comprehensive and centralized, gathering data from such locations as nurses’ stations, patient rooms, hallways and other appropriate locations. This information can then be used to map out problem areas, the first step in devising a noise reduction plan. Any noise monitoring scheme must do so in a way that makes sense when applied to a given situation and time. For instance, the WHO guidelines allow for sound levels during the day to average about 5 dBA higher than those at night, a time when patients are sleeping and getting vital rest. So, a sound monitoring system must be smart enough to distinguish day from night. What’s more, time-of-day considerations may influence operational changes designed to reduce noise, such as scheduling restocking of medical supplies during the day to minimize noise at night. As can be seen, accounting for the inequality of noise is important. And if you want to confirm that all sound isn’t equal by attending a loud concert, go ahead. But think of your health and consider taking along protection in the form of your own personal noise reduction solution – ear plugs. For more information on how to identify and deal with noise, read our white paper! How does your hospital try to reduce night noise?